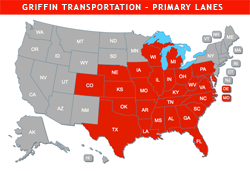 Griffin Transportation, Inc. (Griffin), headquartered in Grand Rapids Michigan, is a full-service ground transportation company offering a variety of logistics services throughout the 48 contiguous states. A stable driver base, well maintained equipment and experienced dispatchers facilitate Griffin providing the highest quality service to its customers. Griffin is Dedicated to Providing Quality Transportation Services. Established in 2008, Griffin is a company dedicated to providing quality transportation services. We separate ourselves from the competition by our willingness to do more for our customers, employees and stakeholders. Our clientele relies on us for their highway transportation requirements and we focus on quality service through consistency, safety and dependable on-time pickup and delivery. At Griffin, we always strive to exceed expectations!